Vesa Kaukonen at KK Superyachts sends word that he’s listed the superyacht Auspicious for sale. Built by Mondo Marine in 2009, she is now extended to 50.8m with many aesthetic and technical improvements after her extensive refit completed during the summer. Her interior received a completely new look and feel, designed by Eidsgaard Design and executed by Vedder GmbH. Her features include fold-down balconies on both sides, a cinema lounge, an elevator to all decks and a hydraulic swim platform. She also has zero-speed stabilisers for safety and comfort. Auspicious now cruises at 15.5 knots with top speed of 18 knots. She accommodates up to 10 guests in five spacious staterooms: The master suite is on the main deck while the lower deck has two twin cabins as well as two double cabins which convert into one full-beam VIP suite by sliding doors. The new cinema lounge can be converted into a sixth cabin for occasional accommodation. 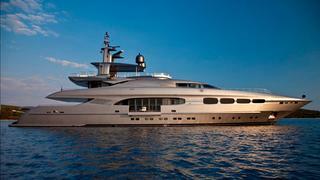 On display at the Monaco Yacht Show, Auspicious is asking €18.9 million.